March 21st is World Down Syndrome Day, which has been officially recognised by the United Nations since 2011. Why 21 march: The date for WDSD being the 21st day of the 3rd month, was selected to signify the uniqueness of the triplication (trisomy) of the 21st chromosome which causes Down syndrome. Down syndrome is a genetic disorder caused when abnormal cell division results in extra genetic material from chromosome 21. Inside the cells of our bodies are tiny structures called ‘chromosomes’. Chromosomes carry the genes that determine how we develop. Most people have 23 pairs of chromosomes in each of their cells. In people with Down syndrome, these pairs don’t divide correctly, and this causes the baby’s cells to have an extra copy of chromosome number 21. The extra chromosome can’t be removed from cells, so there’s no cure for the condition. The chromosomes divide incorrectly by accident, not because of anything the parents have done. Down syndrome causes a distinct facial appearance, intellectual disability and developmental delays. Early intervention programmes with a team of therapists and special educators who can treat each child’s specific situation are helpful in managing Down’s syndrome. There is a lack of understanding of the challenge’s individuals face across their lifetimes and a failure to support them with the opportunities and tools needed to live fulfilling lives. Look out for these hashtags on social media to see some incredible stories. I want to share with you one incredible story that involves young man I was introduced to last year. Meet John Cronin, 23-year-old entrepreneur who happens to have Down Syndrome. John is the co-founder and Chief Happiness Officer of John’s Crazy Socks which has a mission to spread happiness. 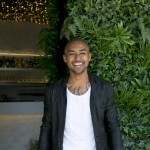 John is Co-founder with his Dad, Mark. When he finished high school he knew he wanted to start a business with his dad. Let me tell you a little about John’s background and experience. John underwent years of schooling. He began his education in the pre-school program at ACDS and still remembers those days fondly. John moved onto the Huntington School system which he completed in June 2017. John’s school work included life skills classes as well as electives such as fashion and photography and he was a proud member of the school chorus. During his last three years, John split his days between Huntington High School and Wilson Tech where he studied office skills and retailing. After school, John participated in the Grand-Friends Club and the Relay for Life events. Wilson Tech named John their Outstanding Student of the Year. John has strong work experience. In the summer of 2016, he worked in the kitchen of a local day camp, Camp Alvernia. For several years, he worked as the mail clerk at a local law firm. Arriving at the office every day after school, John maintained the mail supplies and stamps and made the daily run to the post office, sorting envelopes and packages for the fastest delivery. He also assisted in general maintenance of the office, handling the shredding, running errands and lending a hand whenever he could. 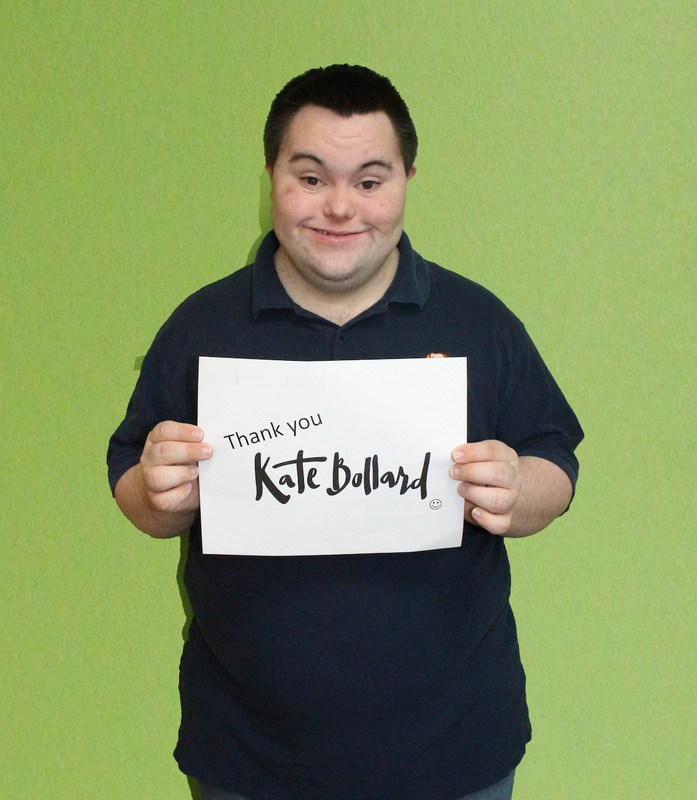 Since an early age, John devoted himself to Special Olympics activities. He engages in snowshoe, basketball, track, soccer, floor hockey and bowling. His efforts have won John numerous medals and invitations to the New York State Games for soccer, track and snowshoe. In fact, John was named an alternate to the U.S. National Snowshoe Team for the Special Olympics World Games in March 2017. And John is a member of the New York State Special Olympic Athlete Congress. He didn’t just wake up and want to start a business. 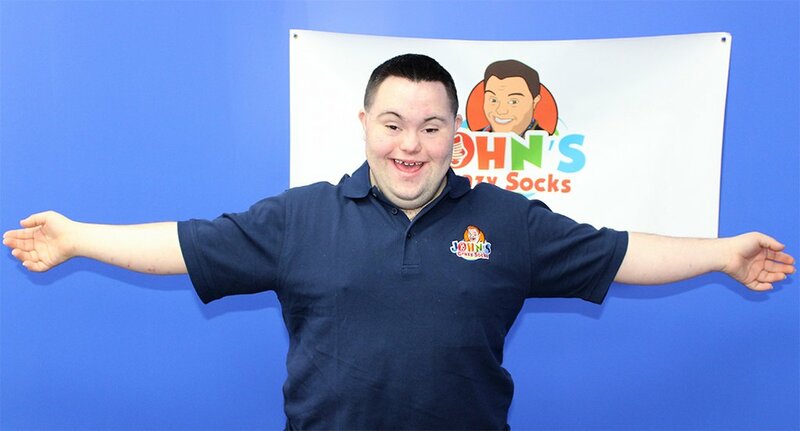 He has passion and drive, John is both the co-founder and inspiration for John’s Crazy Socks. It was John’s deep and abiding love for his “crazy socks” that gave rise to this venture. John has long maintained his personal style that does not conform to whims of the fashion industry: it is a style he makes manifest with his spirit and personality. His colorful, fun and often whimsical socks are just part of who he is. John does a little bit of everything. He writes thank you notes to customers, does thank you videos, helps fill orders and helps pick out the socks that we will carry in the store. And he’s an ambassador. John has appeared on numerous television shows and videos for interviews. He’s got his name above the door, so you know he’s checking to make sure the business fulfills its promises. John has received multiple honors for his work including receiving the Monsignor Thomas G. Hagerty Humanitarian Award from HeartShare Human Services of New York and being named Man of the Year by the Times of Huntington. Microsoft CEO cited John as one of the 10 Change Makers who inspired him in 2018. 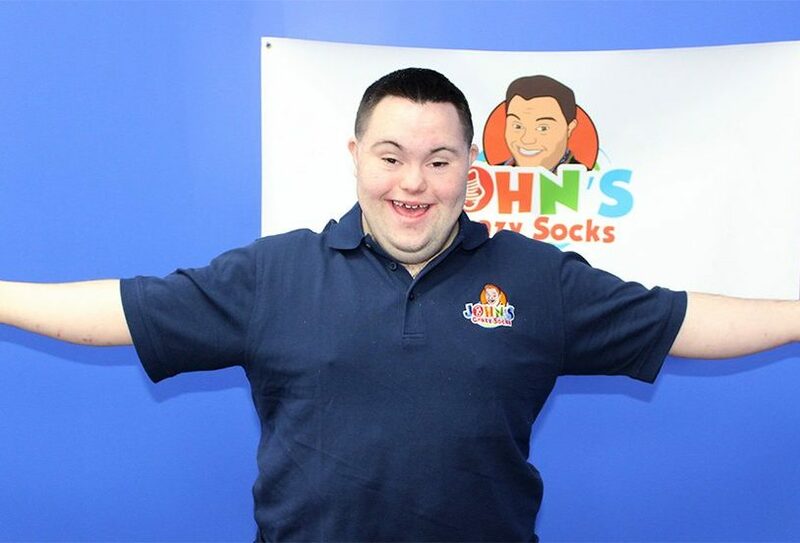 A social enterprise, John’s Crazy Socks employs people with differing abilities and has made Giving Back a core part of its business. John also performs speaking engagements with his co-founder and father, Mark and they have spoken throughout the U.S. as well as in Canada and Mexico. John and Mark are now participants in the U.S. State Department’s Speaker’s Bureau. John is a fierce advocate for people of differing abilities and has testified twice before the U.S. Congress. He has travelled to Capitol Hill on numerous occasions to promote the rights of people with differing abilities. 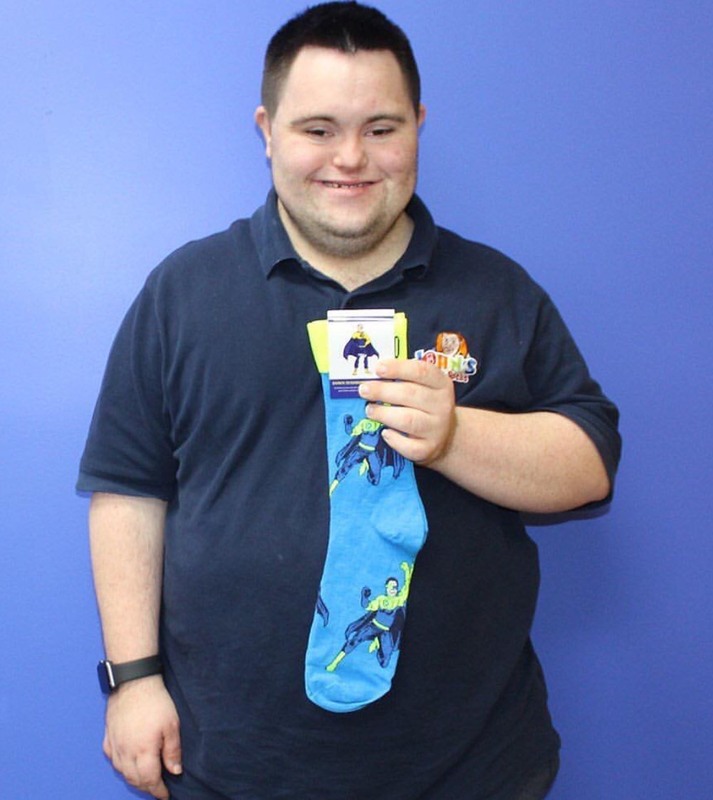 Which is quite fitting considering John’s favourite socks are the Down Syndrome Superhero socks, which he designed himself. The Superhero resembles John, don’t you think? Here is a photo of John showing me them. Giving Back program that John’s Crazy Socks provide, enables them to do more for their charity partners. 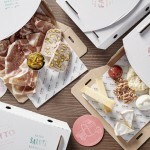 From the day they opened, they have pledged to donate 5% of their earnings to the Special Olympics. After all, John and many of their colleagues are Special Olympic athletes and they see first-hand the many benefits of that organization. As they have grown, they have also grown they’re Giving Back Program. It now includes our Charity and Awareness Socks that raise money for their charity partners like the National Down Syndrome Society and the Autism Society of America. Donating 5%of the sales of their Sock of the Month Club to the Special Olympics. 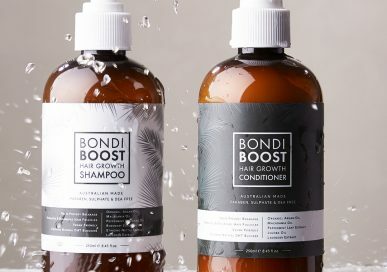 Each month, they publish a Giving Back Report on the website to let customers know what money they raised that month and where it went. The Special Olympics is an amazing opportunity for the athletes to learn what it means to commit to an activity and to work hard for a goal. The sports activities are real, this program helps more than just the athletes. Parents and families get to watch and cheer as these athletes rise to heights no one may have imagined. Not only for health benefits but the experiences John has experienced with the Special Olympics have helped him to grow into the young man he is today. I think we can all learn a lot from John. He’s inspiring, He’s motivating, He has a heart of gold. I feel so blessed to be able to share his story with you all. Thank you, John, for making time to share with me your story.